Bitcoin Developer and Principal Architect at Paxos, Jimmy Song, joins us to discuss the different scalability proposals for which miners are currently signaling their support. Will one of these proposals gain majority support, allowing for the network to upgrade with relative ease, or will we enter a situation where one proposal is backed by a strong minority of users, potentially forking the network into two? Note: After this post was published, MME posted videos of highlights from the talk. They can be viewed here. 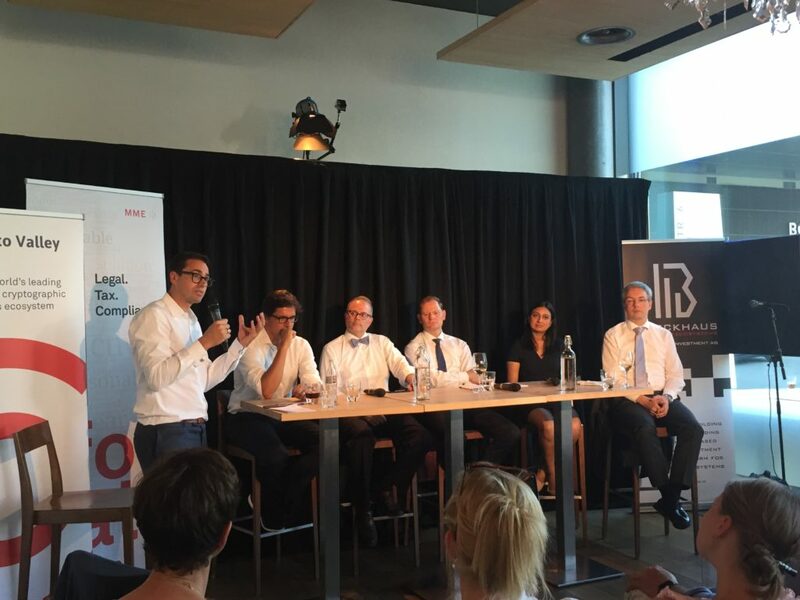 It was a remarkably hot evening for Switzerland, but the topic at the latest Crypto Valley Forum Meetup, held on June 19 in Zug, seemed hotter. Under the headline “Tokenizing: Swiss and US Legal Perspectives on Token Generating Events“, the Meetup drew a capacity crowd of around 150 to hear a panel of Swiss and US lawyers discuss the legal aspects of token generating events (TGEs), more commonly – and, according to the lawyers, rather incorrectly – known as initial coin offerings (ICOs) (see box below). The high level of interest among members of the Swiss crypto community was understandable. For one, while TGEs have quickly established themselves as a powerful way to fund nascent projects, the market exists in a regulatory grey zone. Issuers face a great deal of uncertainty regarding what, if any, financial, tax and other laws may apply, and from which jurisdictions. For another, with representatives from Zug-based MME Legal and US-based Debevoise & Plimpton, the panel arguably contained experts from two of the leading authorities in the world on TGEs. Over 90 minutes the seven panelists covered a lot of ground. Below we present some of the highlights. One key question for TGEs, particularly in the US, is whether or not they are subject to securities laws. Opinions run the gamut. According to Debevoise, which recently published a detailed paper on the subject, the answer depends on the nature of the token. If it represents an underlying asset that has the properties of a physical object then it is likely not a security. If it is rather like a share in a company, then it likely would be one. Similarly, if the token provides holders a passive return on their investment – in other words, if it pays them without them having to do any work – it is likely a security under US law too. This only applies to primary markets, however. Making money because the value of a token rises on a secondary market does not by itself make that token a security. In Switzerland, according to MME, the situation is more black and white. As long as the token is not directly linked to a debt or share, it need not be classified as a security and is therefore not subject to Swiss securities laws. But, as the Swiss law firm was quick to point out, that doesn’t mean holders of TGEs based in Switzerland don’t have to consider the law in other jurisdictions. Anyone selling tokens to US persons, regardless from where, is subject to applicable US laws for instance. This counts for pre-sales and secondary trading via exchanges too. MME recommended that anyone considering a TGE conduct a thorough jurisdictional due diligence ahead of time to avoid any surprises. Another key legal issue facing TGEs is the applicability of financial surveillance and consumer protection regulations, for example anti-money laundering (AML) or investor suitability laws. At the moment, TGEs are not explicitly subject to such regulation, though this may be changing. Japan for example has been introducing additional listing requirements for token launches. As more institutional and retail investors become interested in cryptotokens, we can expect more such rules. While a certain degree of regulation would be welcome, MME said the community needs to work hard to educate regulators to ensure that regulation is prudent. One important contribution the community could make in this regard would be developing its own token classification scheme. To this end MME is working on the concept of a blockchain cryptoproperty (BCP). A comprehensive, well-thought out classification of BCPs by the industry could provide clarity for regulators, resulting – hopefully – in more appropriate rules. Another potentially sticky area for TGEs and blockchain projects in general is data protection laws. As the expert from Debevoise’s Frankfurt office explained, with the new General Data Protection Regulation (GDPR) in Europe, which comes into effect in early 2018, individuals will gain far more control over their personal data than they have now. Among other things this will include a right to know how their data is being used, and a right to be “forgotten” by having their data removed from a platform. The regulation applies to any entity, no matter where it is located, that deals with the personal data of citizens of the EU (as well as Switzerland, which is enacting similar rules). This could cause headaches for blockchain projects in which personal data goes on chain. Because blockchains are immutable, for instance, data can’t easily be erased. The panel recommended that new blockchain projects keep data protection in mind when designing their platforms. Investors should also do a data protection compliance due diligence before they invest in a specific project. In the Q&A that followed the panel, there was lots of interest in the details. One entrepreneur wanted to know if it was possible in the US to get a ruling ahead of a TGE on whether a specific token would be classified as a security. According to Debevoise, this is possible in theory, but difficult in practice. An alternative is to get an opinion from a lawyer that explains in detail why the project thinks its token is or is not a security and have that on hand should the regulator come knocking. Those projects that want to avoid any potential US regulatory compliance obligations can hold a TGE that does not sell to US persons. This too however is easier to do in theory than in practice. To show good faith in the attempt, the holder of the TGE can among other things block US IP addresses during the sale, as some token launches are doing. Projects need to also be very aware of tax issues. Organizations like DAOs can be considered partnerships making members, as well as the organization, potentially liable for taxes, including VAT. While it may not be the most elegant name, MME Legal is very insistent on using the term “token generating event (TGE)” instead of the currently more common “initial coin offering (ICO)”. Not only does ICO raise often inappropriate comparisons to initial public offerings (IPOs), the term does not do justice to the wide variety of ways to issue or create tokens for blockchain-based projects. The Debevoise team agrees, preferring more broad terms like “token launch” to ICO. Investor and Author William Mougayar joined us to unpack token sales / ICOs and understand what is driving the current explosion of interest. With most of the world’s computing power concentrated in Internet companies’ data centers, the Internet has become a very centralized place. We’re joined by Julian Zawistowski and Alex Leverington, CEO and P2P engineer at Golem. We discuss how Golem hopes to create a more balanced distribution of computing power for the Internet. Our regulatory expert Siân Jones joined us to discuss her work on a regulatory framework for distributed ledger technology (DLT) for Gibraltar. We discuss how the framework differs from other efforts and aims to attract rather than curtail blockchain businesses. We also covered why the rapid changes require the flexibility of a principle-based approach to regulation. Finally, we discussed current trends around ICOs and how they could be impacted by regulation. Immer mehr Blockchain-Startups sammeln bei Investoren Geld ein. In Zug lassen sie sich nieder, um die Gelder zu verwalten. Die Kurse von Bitcoin und Ether haben massiv zugelegt. Alle neuen digitalen Währungen weisen zusammen einen Wert von rund 80 Milliarden Dollar auf. Die US-Börse Coinbase verzeichnet täglich 10 000 neue Kunden. Kritiker sprechen von einer gigantischen Blase, Befürworter von einem langfristigen Trend. Doch Börsenkurse und Spekulationen sind nur eine Seite des Phänomens der neuen Währungen, die auch Tokens genannt werden. Weitab des Lärms von Tradern und Allzeithochs wächst die Branche in der Realwirtschaft mit erstaunlicher Geschwindigkeit. Überall auf der Welt kommt es täglich zur Gründung von Startups. Mittendrin steht oft die Schweiz – und vor allem das sogenannte Crypto Valley rund um Zug. Ein Projekt nach dem anderen startet dort. «Zug – das ist die Crypto-Hauptstadt der Welt», frohlockt ein Investor.